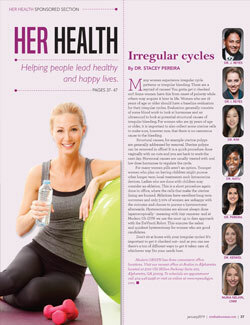 Many women experience irregular cycle patterns or irregular bleeding. There are a myriad of causes! You gotta get it checked out! Some women have this from onset of puberty while others may acquire it later in life. Women who are 18 years of age or older should have a baseline evaluation for their irregular cycles. Evaluation generally consists of some blood work to look at hormones and an ultrasound to look at potential structural causes of irregular bleeding. For women who are 35 years of age or older, it is important to also collect some uterine cells to make sure, however rare, that there is no cancerous cause to the bleeding. Structural causes, for example uterine polyps are generally addressed by removal. Uterine polyps can be removed in office! It is a quick procedure done vaginally with no cuts and you are back to work the next day. Hormonal causes are usually treated with oral low dose hormones to regulate the cycle. For many women pills aren’t an option. Younger women who plan on having children might pursue other longer term local treatments such Intrauterine devices. Ladies who are done with children may consider an ablation. This is a short procedure again done in office, where the cells that make the uterine lining are burned. Ablations have excellent long term outcomes and only 5-10% of women are unhappy with the outcome and choose to pursue a hysterectomy afterwards. Hysterectomies are almost always done laparoscopically - meaning with tiny cameras- and at Modern Ob GYN we use the most up to date approach with the DaVincii Robot. This ensures the safest and quickest hysterectomy for women who are good candidates. Don't sit at home with your irregular cycles! It's important to get it checked out-- and as you can see there's a ton of different ways to get it taken care of, whichever way fits your needs best.